I can’t believe tomorrow is race day! I picked up my bib yesterday at the expo and had this surreal experience as I waited and waited while the volunteer searched for my bib number. She started to get a worried look on her face and I actually had an irrational moment of panic where I thought she was going to say there was a problem and I wasn’t going to get to run the race (this is leftover anxiety from when I qualified for Boston 2015 but found out a few weeks later that my time did not meet the registration cutoff). But then she smiled with relief and handed me bib number 20130 and wished me luck! I confess I got teary when I finally held the bib in my hands (you all know it doesn’t take much for me to get emotional about these things). I’ve gone through waves of nervousness and excitement and now I’m just looking forward to tomorrow and ready to start taking in the whole experience. I trained hard but do not have a goal time in mind. The goal is to enjoy the race while running strong (I have a lot of respect for the history of the Boston Marathon and the course itself, so I want to run strong and well without pushing myself so hard that I miss soaking up the whole atmosphere). I hope that makes sense. I anticipate coming in around four hours or less but who knows how I will feel on race day. I am recovering from a cough and congestion that plugged my ears up on the plane. 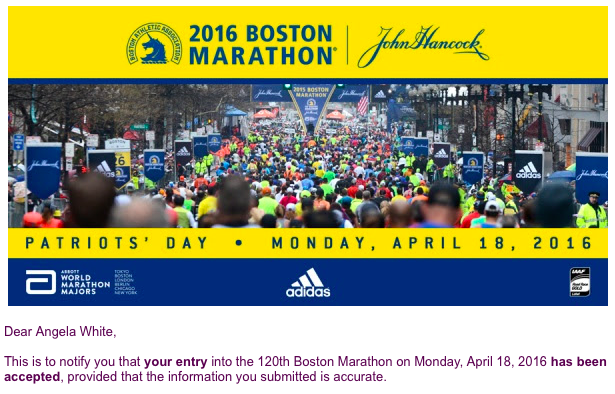 I’m just grateful I can hear again and am well enough to toe the line for the 2016 Boston Marathon!